Welcome to the first review of the new blog! Parallel to the way I started my older blog, this new one will be started not with a 3x3, but a new Square-1. Today we're looking at the MoYu WeiLong Square-1, an anticipated arrival and possibly the first real competitor to the QiYi. 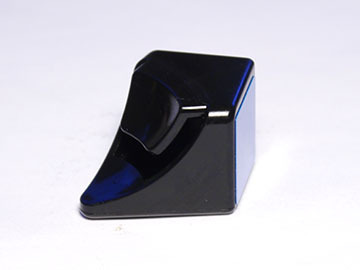 The QiYi Square-1 has dominated the market for a while, remaining the indusputable top choice. it had phenomenal corner cutting, turned the smoothest, and compared to most other Square-1s was just generally a joy to use. Even as YJ released the GuanLong Square-1, the QiYi remained at the top due to the GuanLong's tendency to pop even on reasonable tensions. MoYu hopes to change that with the WeiLong Square-1. Adopting the name of its renowned cousins, the WeiLong Square-1 aims to dominate the Square-1 market just as the WeiLong (and GTS) 3x3x3s did for the 3x3x3 market. 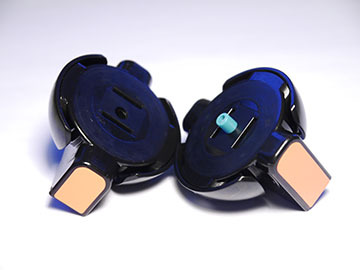 It's not priced quite the same as a WeiLong typically is, though - to stay competitive with the market, it has been set at $11.95, the same price as the QiYi. The WeiLong brings a number of new innovations, theoretically improving performance, comfort, and reliability. Let's see how it stacks up. While it's not immediately apparent just from looking at or even picking up the WeiLong Square-1, the puzzle is in fact not cubic; rather, it's just slightly oblong, measuring in with a 54mmx54mm footprint at 56mm tall. I remember this was met with a very mixed and possibly even slightly negative reaction from the various communication channels I'm part of, eventually even creating a short lived meme of "it's not cubic". Luckily, not being cubic doesn't actually change much. 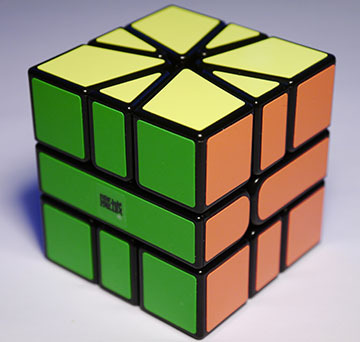 Square-1 is a special puzzle in that during the entire solve the orientation of the puzzle never changes, so the puzzle being taller than it is wide and deep doesn't create any issues with consistency between orientation. The difference is minimal, so even if you do feel a slight difference from a cubic Square-1 it likely won't affect your turning. 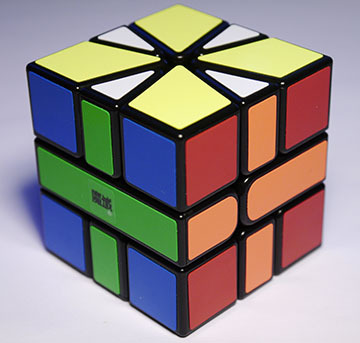 The puzzle is build solidly with MoYu's traditional high build quality, and feels solid and sturdy in the hand. It has the same small Florian holes that the QiYi popularized, and has unfortunately dropped the widened middle layer of the GuanLong Square-1. It weighs in at 88 grams and makes a low, quiet, swishy sound. The stickers are of the MoYu high-quality variant with the typical Moyu scheme. Sadly, due to the design of the pieces this Square-1 is not available in stickerless. This is easily the biggest difference from the QiYi. The QiYi's turning was smooth but slightly clacky between layers, and it was very, very fast. it was almost effortless to misalign the layers or the slice, whether intentional or not. In contrast, the WeiLong Square-1's turning, at least with factory lube, is quite a bit slower and more sluggish - it's still not a slow puzzle by any means, but it's not ridiculously fast either. While it takes a bit more effort to turn, it's both more controllable and more stable and doesn't misalign nearly as easily. It's smoother than even the QiYi and feels less clacky, which personally I enjoy and many others might as well. Initial reviews of the WeiLong Square-1 weren't all that great, and I suspect its corner cutting is why. Out of the box, corner cutting isn't so hot; it cuts just a bit more than half of what the QiYi cuts and takes a bit of effort to do so. After loosening both the layers and the core, however, it improved significantly. It's still not QiYi level, but comes close, and reverse cutting is actually quite a bit better than the QiYi. The GuanLong Square-1 still has the best corner cutting out of the three. Square-1 makers, if you're reading this, the GuanLong should be what you're aiming for! I don't think it's physically possible for this puzzle to pop, not unless you have it on unusable tensions. I'll get into why very soon. If we remember, the GuanLong Square-1 was known for popping quite easily unless tightened a lot, and on looser tensions the QiYi often had strange pops where an edge piece would jump up a bit. It's good to know neither will happen on this puzzle. Here's where Moyu's innovation starts to show. These are the two core pieces. 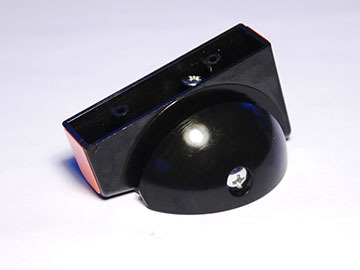 Unlike traditional cores which form a hollow ball to allow the pieces to rotate, this core is shaped like a mushroom, and the pieces slide between the cap and the main piece. 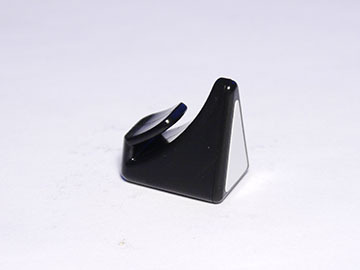 In order for any pop to happen, the pieces wouldn't have to slide up and out like most Square-1 pieces would; rather, they have to slide down and out, which is more or less impossible. Hence, its pop resistance is excellent. The friction surface between the two pieces is humongous, and seems to be designed that way. That could be why the slice is slower and more stable. How's the core in terms of performance? I can't say definitively yet. This is the only Square-1 with this core, and its corner cutting is a tad behind the Qiyi which uses a more traditional core, but future iterations may very well improve it. Another thing that sets this puzzle apart - see that screw head on top of the mushroom cap? It's spring loaded, which makes the layers truly tensionable independently of the core. It works well, too - loosening the layers did make them noticeably more flexy than they were before, and I've been able to achieve an extremely loose slice and extremely tight layers as well as vice versa. Just remember you have to do it four times, twice per core half, so try to keep them even. The edge piece. Nothing too special, but we do get to see the new design that's supposed to slide under the mushroom core rather than over a traditional core. All in all, very novel design. Props to MoYu for trying to push Square-1 mechanics. None of us can be sure which mechanism will prevail in the long run, but the WeiLong Square-1 is excellent for a first attempt at a new mechanism. Unfortunately, I don't see this puzzle being magnetized unless you're willing to drill holes or place magnets only in corners, which could result in the effect varying between the top and bottom layer (for example, if there were 6 corners on top and only 2 on the bottom). The edge pieces don't have any space for magnets. I guess an easily magnetized flagship Square-1 will remain out of reach for a bit longer. This is an excellent Square-1, and a strong attempt at a new mechanism as well as a strong competitor to the QiYi. Turning is smooth and stable and could suit both beginner and professional very well. It falls just a bit short in corner cutting, but the edge piece pop issue on the QiYi is gone, replaced with a mushroom core and with it, a new, previously unseen degree of customization. Being a novice Square-1 solver, I really enjoy the controllability and stability of this puzzle, as well as its smooth turning feel. I do wish it was a bit faster, but increasing the speed could lose some of the stability and ultimately the stability is more important for me. It's putting up a strong fight for my main, and right now has the upper hand over the QiYi. Final thoughts? Even if it doesn't fully take over the market, which I don't think it will, the WeiLong Square-1 has the potential to put up an excellent fight with the QiYi Square-1. It could very well take over the beginner market, with its more beginner-friendly performance. All in all, MoYu put forward an excellent puzzle, and I certainly look forward to more in the future. That's it for the first review! I have to say I'm really enjoying the new blogging layout, especially the excerpt function - thanks for setting it up for me, SpeedCubeShop! Hopefully this will allow me to get even more reviews out faster than ever. Thanks for reading, everyone! Stay tuned for more! I could be wrong, but I think it may be because there design or aim of product is identical to it’s namesake. Why do you think they are naming new cubes after 3×3′s?